At Profit Plant we work with a team passionate about plants and specialised in the supply of in- and outdoor plants to garden centres across Europe. 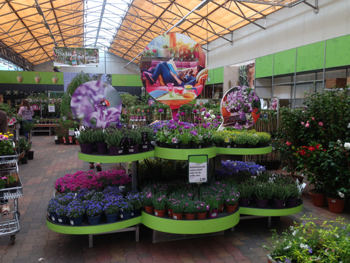 Our company is founded in 1980 and has been focussed on supplying top quality plants to garden centres ever since. Profitplant is based in a central location at Flower Auction Flora Holland in Aalsmeer, only a couple of minutes away from Schiphol airport. At Profit Plant we believe in long lasting relationship with our growers, logistic partners and our customers. The best way to achieve growth in our mutual businesses is by working together in all levels of the supply chain from breeder to final consumer. In all we do, product quality is the key! The product knowledge gathered over the past years combined with our grower relationships enable us to guarantee top quality in our full assortment. 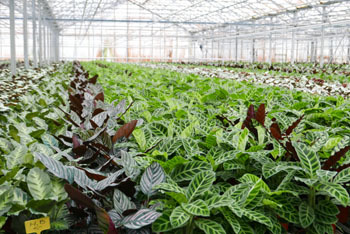 At Profitplant we offer a vast range of in- and outdoor plants. Every week you will have access to an assortment of approximately 6.000 different lines. All our plants can be ordered in small quantities, per tray, per shelf or by the trolley. As our ranges fluctuate with the season, this will enable you to compile your offer based on the season and demand of your customers. This in combination with frequent supply options will ensure a fresh and up to date assortment on a weekly basis. 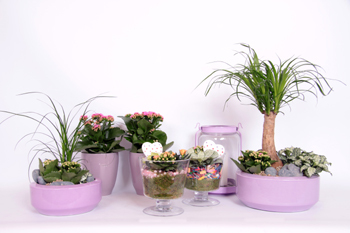 On our web shop you will find a large range of pot-plant combinations. Many options in glass, zinc, wood etc. which we describe as added value ranges. The standard added value ranges are offered and produced at the grower and are presented to retailers all over Europe and beyond. Unique in the Profitplant offer is the supply of tailor made added value lines. Profitplant offers a large range of ceramics, zinc, baskets and glassware. These ranges can be bought on our web shop to be sold at your garden centre individually but are also to be used by Profitplant to create your own added value ranges. For this we can offer you the help of our experienced in house designer. Once the ranges have been agreed Profitplant has its own facilities to produce your arrangements in house, label them and add them to your weekly order. Through our knowledge about plants, market development and consumer trends we are able to present ourselves as a strong trading partner. Our weekly visits and contact with our growers present us the latest update on new and innovative products and are an ideal way to monitor the quality of the ranges offered. Next to this, these visits are used to share our knowledge about trends and consumer requirements with the grower. Our representatives are visiting customers, supermarkets, DIY and other retailers in the UK on a frequent basis, this to gain the latest market information and ensure our offers are in-line with market requirements. Next to this we do encourage our customers to come over to Holland. This to visit shows and growers, share experiences and information and discuss the future strategy. With a couple of our customers we have recently discussed and looked at the house plant department in their garden centre. The aim of this exercise was to explore the possibilities to improve presentation and lay-out of the department. As a result of this discussion the Profitplant and the staff at the garden centre have spent a day in the house plant department together to bring the exercise in practise; With an uplift in house plant sales being the positive outcome! We endorse the importance of being a full service trade partner to our customers. We want to make plant ordering as much fun and as easy as we possibly can. Also receiving the plants and putting them out on the shop floor needs to be a fest and as easy and quickly as possible! Any questions or interested in a log-in code for our web shop?